Oates has written many great books, and this one, though not discussed as often as her award-winning novels, is, in my opinion, her best work, and deserves to be mentioned as one of the best collections of stories in the latter half of the twentieth century. Joyce Carol Oates’s second short story collection, Upon the Sweeping Flood & Other Stories, turns 45 this year, and it seems to have aged well. 1994: Greg Johnson, literary critic and future biographer of JCO, published a study of the collection (Out of Eden: Oates’s Upon the Sweeping Flood) in Midwest Quarterly. Dramatizing a modern world lacking structure and coherence but seething with vibrant, uncontrolled energies, this aptly-titled volume portrays a variety of individuals seeking moral significance in lives that are buffeted mercilessly by social, economic, and psychological forces that often seem beyond their control or understanding. 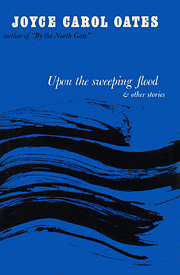 Upon the Sweeping Flood examines the sterility of modern religious and academic institutions, the conflicted identity of women entrapped in limiting social roles and personal relationships, and the general inability of her characters, whether male or female, whether among an intellectual elite or the rural poor, to impose structure and control upon the sweeping flood of experience. Oates’s title, taken from the Edward Taylor poem appended as an epigraph to the collection, evokes an image expressing better than any other in her oeuvre the essential Oatesian vision of our human predicament. As Karl Keller has noted, “All of the stories in the collection are related in one way or another to the general theme of Taylor’s poem: the disparity between man’s desires and his deserts, and his inability to bridge the gap between himself and anything ultimate.” The title also recalls Oates’s intense reaction to first reading Nietzsche, at age eighteen: “what visceral unease!—as if the very floor were shifting beneath one’s feet.” Throughout this collection, Oates places her characters within a shifting, chaotic landscape tentatively poised at the edge of the Nietzschean abyss. 2011: Alan Heathcock, whose first story collection, Volt, places him at the beginning of a promising literary career, writes of inspiration he’s received from a master. I own an old ragged paperback of the story collection Upon the Sweeping Flood. The pages are yellow and brittle. On the first page, before any of the stories, is a quote from Oates: “I am concerned with only one thing, the moral and social conditions of my generation.” Just like that. So easy, so focused. My problem is clear. I am distracted, focusing on many things, while her concern is distilled into a single sentence. And oh how she pays out that focus. Read the full essay at beatrice.com. While teaching at Boise State University, I had a macho ranch-raised kid declare he never read women writers because they only wrote meek stories about domestic life. To combat his ignorance, I gave him the story “Upon the Sweeping Flood” from the collection of the same name. The story—about a man who drives headlong into a hurricane only to become stuck in a farm-house with a teenage boy and girl—rages with the ferocity of a great storm and ends with possibly the most shocking violence I’ve ever read. It made the ranch-kid eat his hat (and words). Oates has written many great books, and this one, though not discussed as often as her award-winning novels, is, in my opinion, her best work, and deserves to be mentioned as one of the best collections of stories in the latter half of the twentieth century.